A 17-year-old Syrian refugee has walked more than 300 miles carrying his pet dog after he could not bear to leave the animal in his war-torn homeland. Aslan, from Damascus, was interviewed by the UN's refugee agency (UNHCR) after arriving on the Greek island of Lesbos. Holding the tiny dog as it yapped happily in his arms, he said: "I love this dog, I need her." 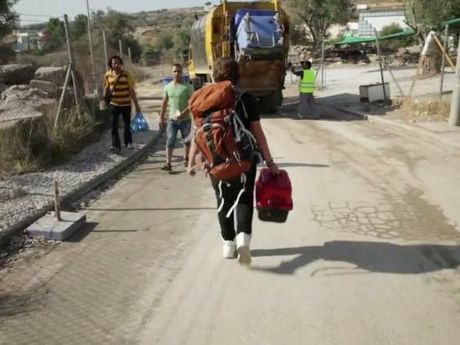 The teenager said he had walked at least 500km carrying all his belongings in a rucksack, and holding the dog in a red carrier. "The dog is Rose," Aslan said, holding up his pet's animal passport, before giving her a drink from his water bottle. "They said 'you can't take your dog'. I have food and I have water, I have everything." When asked by aid workers why he did not leave Rose in Syria, he replied: "I love my dog. A spokesperson for the UNHCR said it had seen "many" refugees like Aslan carrying their animals with them on dangerous journeys from the Middle East, across the Mediterranean and onwards through Europe. "When forced to flee home because of war, many people would never dream of leaving their pets behind," she added. Of the 300,000 refugees and migrants who have arrived in Greece so far this year, more than 93,000 have landed in Lesbos, where the infrastructure is unable to cope. Eric Kempson, 60, has worked with his wife and teenage daughter to transform their home into an impromptu base of operations for humanitarian efforts. "I'm here and I'm a human being," he told The Independent. "When you see these babies suffering you can't just watch." A five-year-old girl was among more than a dozen Syrian refugees believed to have died on Saturday when their dinghy sank on the way from Turkey to the island. Many of the refugees and migrants reaching Greek islands continue their journey through the Western Balkan route, which is becoming increasingly difficult after Hungary closed its border with Serbia and other countries started increasing controls. The UN estimates that 80 per cent of the people entering Europe through the Balkans are from Syria, Afghanistan and Iraq, with the remainder from a range of countries including Pakistan, Bangladesh, Burundi and in Sub-Saharan Africa. According to UNHCR figures, more than 442,440 people have crossed the Mediterranean Sea to Europe so far this year and 2,921 have died attempting the voyage.